The below biography celebrates the life and ministry of J. Raymond Cope with a special focus on his ministry at the First Unitarian Church of Berkeley. 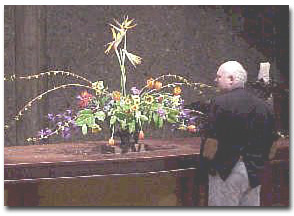 In 1946, the First Unitarian Church of Berkeley entered upon a 22-year period of opportunity transformed into achievement, big difficulties faced but surmounted. The area served by the church, beginning with the exodus from San Francisco following the 1906 earthquake and culminating in World War II, became big-city, with much industry and commerce. The nation began a period of great economic prosperity combined with unprecedented government borrowing from future generations‚ plenty of money to defend free enterprise and democracy in war and to share-the-wealth on a massive scale. This concern for the less fortunate has continued to this day. In all churches, particularly Unitarian Universalist, religious faiths, as such, became less important as socio-political advocacy became more important. 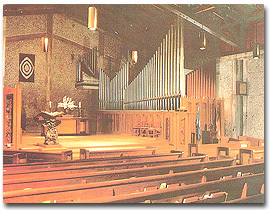 The First Unitarian Church of Berkeley family swelled to over 1,000. Its influence in the community rose. The University expanded into a huge, nine-branch institution, and this church’s influence on it and on the student body, once high, faded steadily to almost nothing. However, in outgrowing the church, UC became, unwittingly, its benefactor. The more one knows about this period in the church history–Dr. J. Raymond Cope’s 22-year ministry–the better one understands why so many who knew him esteem him so highly. He came from a Salt Lake City pastorate, at age 40, with a philosophy, teaching, and social service as well as ministerial background. He served here until his retirement, the big church on the hill his crowning glory. Cope had character, charisma, modest friendliness, and intellectual ability combined with open-mindedness, inventiveness, and willingness to progress. He was sincere about himself but could always take a humorous approach to himself. He was not above doing a church maintenance or carpentry chore. To him, religion was a great and enduring human need. His concepts of God, morality, forgiveness, and conscience were taken over intact by many. His sermons were interesting and challenging. Neither Humanist, Theist, nor Deist, he minimized differences between members’ philosophies and maximized what they had in common. He could inspire and lead the young as well as adults and the elderly. As with all strong personalities, he had some dissenters to his leadership, but, forgive the pun, Dr. Cope could cope better than most, and much of any minister’s life is coping. The church building at Bancroft and Dana was six years old when this picture was taken in 1904. Photo courtesy of Bancroft Library. 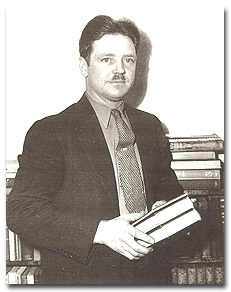 One of the first activities under Dr. Cope’s inspiration was a series of lectures on philosophy. They were well attended, covered a wide range of subjects, and utilized the abilities of the many people who characterized the growing congregation. A permanent Philosophers Club resulted. Dr. Cope once remarked that he almost did not come to this pastorate “because there were so many famous names on the church rolls. They frightened me. Most churches today are confused as to why they are in existence, and a minister fears to say what he wants to say because it might alienate. But a congregation should not be afraid to hear what the minister has to say.” Were the scientific thinkers, who had turned to Unitarianism fifty years before, now feeling they had outgrown it? In 1950, the Liberal Jewish community, which had been using the church’s facilities for years, expressed its gratitude by sending Dr. and Mrs. Cope to Israel with a tour sponsored by the American Christian Palestine Committee. He shared the experience by giving lectures on Israel and Near East difficulties as far away as Utah and wrote a feature article for the Christian Register. A year later he received B’Nai B’rith’s “Most Distinguished Citizen” award. Dr. 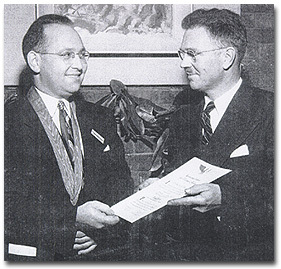 Cope receiving the Most Distinguished Citizen award from B’nai B’rith in the early 1950s. In 1950, Cope became chair of a local non-profit radio station. That same year the church cooperated in a group therapy experiment with the University of California’s Psychology Department experts. Cope filled the sample of referrals and participated throughout this first and largest experiment of its kind. The study was reported in the Journal of Social Issues, and the church continued with a group therapy program of its own. The formative months of the United Nations were big moments in the life of the church and some of its members (e.g. Aurelia Henry Reinhart). Cope continued his activities vigorously until his retirement, became prominent in civil rights, marched at Selma, was an opponent of the war in Vietnam, and an organizer of Ministers Mobilization. Early in the 1950’s, the State of California extended the control over the religious activity of citizens that had begun in 1930 with the Constitutional Amendment and taxation of “outside” church income. First, having the Bible read fifteen minutes a day in all classrooms was legislated. In 1952 Dr. Cope advised the congregation that this law should be protested. In 1953, the Levering Act required that all teachers and college faculties sign a loyalty oath, with the choice of do or be discharged. In 1954, churches were notified that ministers must sign the loyalty oath or their churches would be subjected to additional taxation. The church stood firm, refusing to have the minister sign a loyalty oath, and paid the tax. Then, with the cooperation of three other California churches, two of them Unitarian, we took the matter to court all the way to the Supreme Court where all of the Levering Act was declared unconstitutional. The taxes that had been paid were refunded with interest. 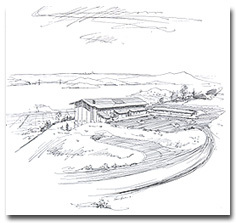 An artists’s view of the new church, overlooking the bay from its perch in the Berkeley Hills. In the 1950s, with new spirit, growth and activity, plus the baby boom, the church was bursting at the seams. Having paid off the mortgage on the first church and, following the settlement of financial and legal negotiations with the University, we went into action on new plans for a building in a new location. Knowing a large building fund would be necessary, the church employed a fund-counseling service and, with their recommendations and help, raised $195,000 in a three-year period. The generosity of fellow member Bernard Maybeck and his family enabled the purchase of our present site, originally a total of eleven acres, at 10¬¢ per square foot. In 1955, building and landscaping architects were engaged, and surveying was begun. At the same time, the University of California, as a state agency, condemned the church’s property at Dana and Bancroft, insisting that the value they gave it was correct. We disagreed and, engaging the best lawyer, appraisers, contractors and engineers we could find, took the matter to court. After a two-week hair graying trial, we won a settlement of $329,400, $130,000 higher than the best UC offer. With this and the fund drive money and “a half-ton of blueprints,” the church was built. 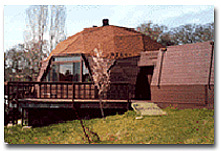 An original design, high on the Berkeley hills, it offers a view of the whole bay and Golden Gate, a magnificent panorama. Most unfortunately, in the midst of all of this supreme effort, 60 families left the church and formed the Berkeley Fellowship. Dissatisfactions—some are always present in any organization—came to a boil in the heat of the fund raising, church planning activity. Building a church can cause as much emotional strain as financial strain, and this one was no exception. Berkeley’s first “Doctors of Durability” participate in a ceremony of recognition. From left; A.P. 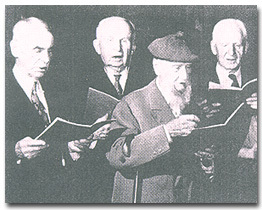 Lange, 82; Earl Morse Wilbur, 86; Bernard Maybeck, 92; Frank Lawrence, 80. During the 22 years of Cope’s pastorate, congregation participation rose to a crescendo. In 1952, so many helped that the church was redecorated on a weekend and the Parish Hall in a day. In the new building, by 1965 there were twenty volunteers helping the paid staff on a regular basis and seventeen active committees reporting to the annual meeting. 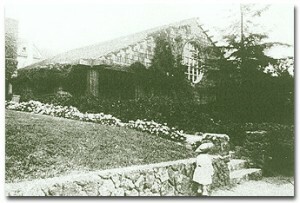 “War babies” swelled the Sunday School, and promptly a new building—plus an addition to the main building—was erected. A custodian’s cottage was added, the fountain was added in the Atrium, the cottage at Inverness modernized. In memory of her parents and grandparents, who had been members of the church, Edith McGrew canceled the $93,000 second mortgage she held on the church, bringing members’ equity in the church property to $900,000. Annual budgets were in the eighty thousands. Choir, musicals, plays, lectures prospered. A symphony orchestra was sponsored and the Women’s Alliance established the Stebbins Institute, an annual summer religious conference at Asilomar near Monterey. Honorary “Doctors of Durability” were conferred annually upon still active oldsters. Visual aids were adopted in the Sunday School. After Dr. Cope’s resignation at 62, the socio-political developments of the 1960s continued, particularly in the city of Berkeley, where they seem to have led the rest of the country in timing and in degree. These events and developments resulted in considerable turmoil within the church family, particularly between the younger activists and the middle-aged and elderly. It is possible that Cope foresaw such effects and, despite his experience and momentum, thought that a younger minister could surmount or channel them more effectively than he. 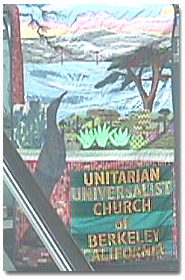 — Abridged from The Unitarian Universalist Church of Berkeley: A History by Merv Hasselmann (1981).